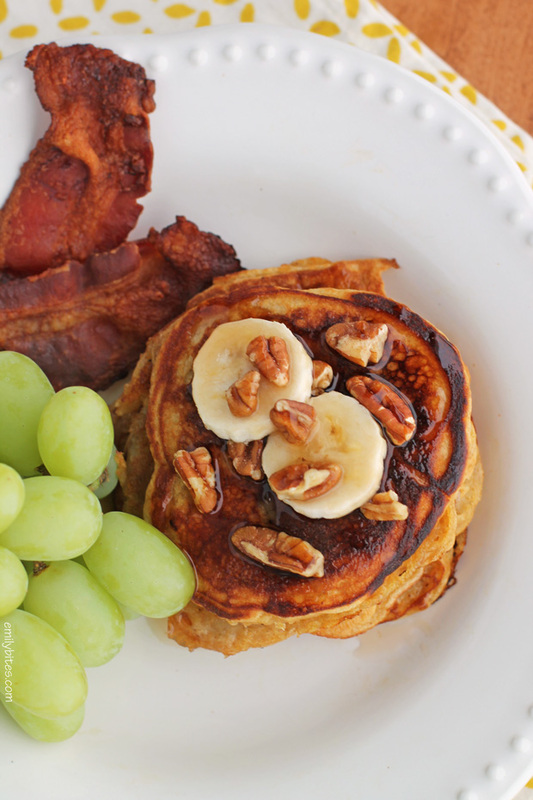 These Silver Dollar Banana Pancakes make for a sweet and tasty breakfast that comes together quickly and with ease. Originally I planned to make these normal-sized, but I decided to go with silver dollar pancakes because they’re adorable and it’s fun to get a stack of four smaller pancakes instead of two average ones. 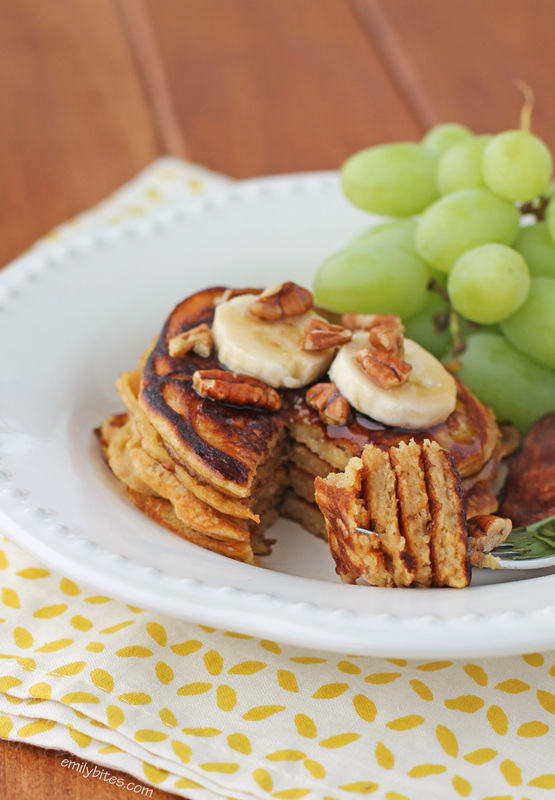 The pancakes are full of banana flavor and you can easily reheat any leftovers for future breakfasts. 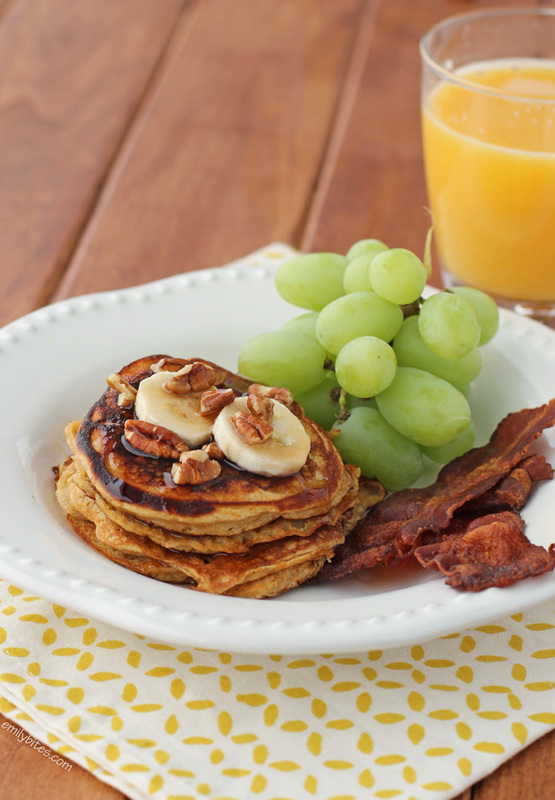 I topped my pancakes with a sprinkling of chopped pecans and a drizzle of light syrup in the photos (I love pecans with bananas), but you can use whatever toppings sound good to you. I highly recommend serving these with bacon, sausage, or the breakfast meat of your choice because these sweet pancakes pair beautifully with smoky bacon or savory sausage. Check out my breakfast category for more tasty morning meal ideas! In a large mixing bowl, combine the yogurt, egg and honey and stir until well combined. Add the flour and baking soda and stir together until a batter forms. Add the banana rounds and gently mix into the batter. Mist a griddle pan with cooking spray and bring it over medium heat. Scoop 1/8 cup (2 tablespoons if you don’t have a 1/8 measuring cup) of batter onto the heated pan and use the back of a spoon to smooth it out into a flat(ish) circle. Repeat in batches (depending on how many pancakes fit on your pan at once) to form 12 small pancakes. Cook on one side for 2-4 minutes until bottom is golden and pancake is “flippable.” If the batter is not firm on the bottom yet it needs more time. Once flipped cook another 1-2 minutes until golden on the other side as well. Repeat until you have 12 small pancakes (pancakes in later batches will cook in less time, so keep a close eye on them). These look SO good, and I am pinning them. Question/ tip: Have you tried whole wheat pastry flour yet? (<- my new obsession, and no I do not work for the flour-makers). It is lighter and fluffier. I have used it for muffins, pizza crust, etc. Soooo good! I used my 1/8 cup measuring cup – I’m sorry to hear that! I have a question about the 14g of sugar. Is that a typo? When I enter the ingredients into my WW app is gives me 7 SP. if I change the number to 1.4g, I get 5 SP. I made these pancakes this morning. They were so yummy! Everyone cleaned their plate!